For the telecommunications concept, see Handshaking. A handshake is a globally widespread, brief greeting or parting tradition in which two people grasp one of each other's like hands, in most cases accompanied by a brief up-and-down movement of the grasped hands. Archaeological ruins and ancient texts show that handshaking – also known as dexiosis – was practiced in ancient Greece as far back as the 5th century BC; a depiction of two soldiers shaking hands can be found on part of a 5th-century BC funerary stele on display in the Pergamon Museum, Berlin (stele SK1708) and other funerary steles like the one of the 4th century BC which depicts Thraseas and his wife Euandria handshaking (see images on the right). The handshake is believed by some to have originated as a gesture of peace by demonstrating that the hand holds no weapon. Meanwhile, Muslim scholars tell that custom of handshaking was introduced by the people of Yemen. Antiochus I Theos of Commagene, shaking hands with Heracles 70–38 BC, Arsameia. 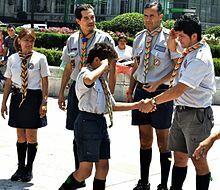 Leaders welcome a boy into Scouting, March 2010, Mexico City, Mexico. Note the left-handed handshake. The handshake is commonly done upon meeting, greeting, parting, offering congratulations, expressing gratitude, or completing an agreement. In sports or other competitive activities, it is also done as a sign of good sportsmanship. Its purpose is to convey trust, respect, balance, and equality. If it is done to form an agreement, the agreement is not official until the hands are parted. Unless health issues or local customs dictate otherwise, usually a handshake is made with bare hands. However, it depends on the situation. In Anglophone countries, handshaking is common in business situations. In casual non-business situations, men are more likely to shake hands than women. In the Netherlands and Belgium, handshakes are done more often, especially on meetings. In the United States a traditional handshake is firm, executed with the right hand, with good posture & eye contact. In some countries such as Turkey or the Arabic-speaking Middle East, handshakes are not as firm as in the West. Consequently, a grip which is too firm is rude. Hand shaking between men and women is not encouraged in the Arabic world. You should only use your right hand as well. Moroccans also give one kiss on each cheek (to corresponding genders) together with the handshake. Also, in some countries, a variation exists where instead of kisses, after the handshake the palm is placed on the heart. In South Korea, a senior person will initiate a handshake, where it is preferred to be weak. It is a sign of respect to grasp the right arm with the left hand when shaking hands. It is also disrespectful to have your free hand in your pocket while shaking hands. Related to a handshake but more casual, some people prefer a fist bump. Typically the fist bump is done with a clenched hand. Only the knuckles of the hand are typically touched to the knuckles of the other person's hand. Like a handshake the fist bump may be used to acknowledge a relationship with another person. However, unlike the formality of a handshake, the fist bump is typically not used to seal a business deal or in formal business settings. The hand hug is a type of handshake popular with politicians, as it can present them as being warm, friendly, trustworthy and honest. This type of handshake involves covering the clenched hands with the remaining free hand, creating a sort of "cocoon". Another version popular with politicians is a "photo-op handshake" in which, after the initial grasp both individuals turn to face present photographers and camera men and stay this way for several seconds. In Liberia, the snap handshake is customary, where the two shakers snap their fingers against each other at the conclusion of the handshake. Handshakes are known to spread a number of microbial pathogens. Certain diseases such as scabies are known to spread the most through direct skin-to-skin contact. A medical study has found that fist bumps and high fives spread fewer germs than handshakes. In light of the 2009 H1N1 pandemic, the dean of medicine at the University of Calgary, Tomas Feasby, suggested that fist bumps may be a "nice replacement of the handshake" in an effort to prevent transmission of the virus. Following a 2010 study that showed that only about 40% of doctors and other health care providers complied with hand hygiene rules in hospitals, Mark Sklansky, a doctor at UCLA hospital, decided to test "a handshake-free zone" as a method for limiting the spread of germs and reducing the transmission of disease. However, UCLA did not allow the ban of the handshakes outright, but they rather suggested other options like fist bumping, smiling, bowing, waving, and non-contact Namaste gestures. Atlantic City, New Jersey Mayor Joseph Lazarow was recognized by the Guinness Book of World Records for a July 1977 publicity stunt, in which the mayor shook more than 11,000 hands in a single day, breaking the record previously held by President Theodore Roosevelt, who had set the record with 8,510 handshakes at a White House reception on 1 January 1907. This had already been broken, in 1963, by Lance Dowson in Wrexham, N. Wales who shook 12,500 individuals hands in 10 1/2 hours. This was recognised by the Guinness World Records Organisation and published in their 1964 publication. WSAI DJ Jim Scott broke the record at Northgate Mall, Cincinnati, Oh. On 31 August 1987 Stephen Potter from St Albans Round table shook 19,550 hands at the St Albans Carnival to take the World record for shaking most hands verified by the Guinness Book of records. The record has since been exceeded but has been retired from the book. Stephen Potter still holds the British and European record. On August 15, 2008 Kirk Williamson and Richard McCulley broke the Guinness Book's World Record for the World's Longest Handshake (single hand) when they met at Aloha Stadium in Honolulu, Hawaii and shook hands for 10 hours besting the previous record of 9 hours and 19 minutes set in 2006 On 21 September 2009, Jack Tsonis and Lindsay Morrison then broke that record by shaking hands for 12 hours, 34 minutes and 56 seconds. Their record was broken less than a month later in Claremont, California, when John-Clark Levin and George Posner shook hands for 15 hours, 15 minutes, and 15 seconds. The next month, on 21 November, Matthew Rosen and Joe Ackerman surpassed this feat, with a new world record time of 15 hours, 30 minutes and 45 seconds certified in the latest edition of the Guinness Book of Records on page 111. At 8 pm EST on Friday 14 January 2011 the latest attempt at the longest hand-shake commenced in New York Times Square and the existing record was smashed by semi-professional world record-breaker Alastair Galpin and Don Purdon from New Zealand and Nepalese brothers Rohit and Santosh Timilsina who agreed to share the new record after 33 hours and 3 minutes. In June 2016, an Algerian woman married to a Frenchman took part in a naturalization ceremony (cérémonie d’accueil dans la citoyenneté française) in the Département where the couple lives. She refused to give a handshake to the prefect and to a local representative and claimed her religious faith would ban her from touching foreign men. Thereupon, she did not receive the French nationality. On 20 April 2017, Prime Minister Bernard Cazeneuve signed a decree approving that decision. The Algerian woman filed a suit. On 11 April 2018, the Conseil d'État approved the decree. ^ a b "Fist bumps, high-fives spread fewer germs than handshakes, study says". Los Angeles Times. 28 July 2014. Retrieved 7 June 2015. ^ a b "Attention Germaphobes: A Less Icky Alternative to the Handshake". ABC News. Retrieved 7 June 2015. ^ Thomas, Chris (27 August 2009). "Handshake – Priest and two soldiers, 500BC. Pergamon Museum Berlin (SK1708)". Picasa Web Albums. Google. Retrieved 4 September 2011. ^ Busterson, Philip A. Social Rituals of the British. ^ "Shaking hands with women". GQ. Condé Nast Digital. 2000. Retrieved 4 September 2011. ^ Post, Emily (1922). Etiquette in Society, in Business, in Politics and at Home. New York: Funk & Wagnalls. Chapter 3. ^ "Why Do People Shake Hands? | Why Do People". whydopeople.net. 2012. Retrieved 21 May 2012. ^ a b c d e f g h i Theconnectedwoman.com – "Handshakes from Around the World"
^ "Shaking Hands Around the World". wisc-online.com. 2012. Retrieved 21 May 2012. ^ Strubbe, Kevin; Hobert, Liesbeth (2009). Etiquette in het buitenland [Etiquette Abroad] (in Dutch). Leuven: Van Halewyck. ISBN 978-90-5617-910-6. ^ Handshake: Student's Book: A Course in Communication. OUP Oxford. 7 November 1996. ISBN 978-90-5617-910-6. ^ Idan Frumin; Ofer Perl; Yaara Endevelt-Shapira; Ami Eisen; Neetai Eshel; Iris Heller; Maya Shemesh; Aharon Ravia; Lee Sela; Anat Arzi; Noam Sobel (3 March 2015). "A social chemosignaling function for human handshaking". eLife Sciences. ^ NCTAMSPAC, Public Affairs Office (Fall 2008). "Sailor & Coast Guardsman Go for World Record Handshake for Charity Event" (PDF). Info Domain. Retrieved 31 January 2009. ^ McClymont, Mhairi (21 September 2009). "Great shakes! World record raises charity funds". ABC News. Retrieved 9 September 2011. ^ "Movers and shakers – an article on the new World Record". The Jewish Chronicle. 3 December 2009. Retrieved 9 September 2011. ^ "Longest Handshake: Team New Zealand and Team Nepal set world record". New York City: Worldrecordsacademy.org. 18 January 2011. Retrieved 4 September 2011. ^ Galpin, Alastair. "Records achieved". WorldRecordChase.com. Longest continuous handshake. Retrieved 4 September 2011. ^ "Kiwis break world record for a handshake". TVNZ.co.nz. Television New Zealand Limited. 17 January 2011. Retrieved 9 September 2011. ^ En quoi consiste la cérémonie d'accueil dans la citoyenneté française ?